Ash Kalra, City Council District 2, will cut the Ribbon to celebrate Californias largest multi-unit residential solar hot water project at Tradewinds Condominiums in San Jose. San Jose, California - The Tradewinds, a community of condominium homes nestled in the heart of San Jose’s Blossom Valley, is the largest multi-unit residential solar water heating project in California. In celebration of Earth Day, Councilmember Ash Kalra, District 2 of San Jose, will cut the ceremonial ribbon for the project on Monday, April 22nd, at 12 PM. The Tradewinds is a community of 320 residential units, approximately 80% of which are owner occupied. The condominium complex uses an average of 10,000 gallons of hot water per day for showers, laundry, dishwashers, and other residential hot water necessities. Heating water with solar energy rather than with natural gas will reduce the building’s water heating bills by as much as 60%. Free Hot Water, the project’s San Jose-based engineer and designer, used a total of 183 commercial grade solar hot water collectors mounted on five tar and gravel roofs of the two story buildings in the Tradewinds complex. One of the Tradewinds Roofs, San Jose, Calif. In addition to the long-term cost and environmental savings for the Tradwinds, Renewable Technology Developments Inc, the project’s leasing partner and owner, received a substantial rebate from the California Solar Initiative Thermal Program, a 30% Federal Investment Tax Credit, as well as other tax savings, all of which significantly reduced the final cost. 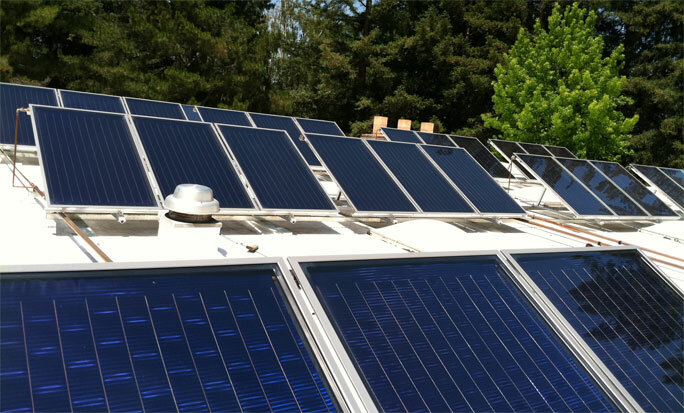 Free Hot Water, based in San Jose, California, designs, engineers, manufactures and distributes high quality solar thermal systems and products for commercial and residential applications. Our San Jose in-house engineering department works with installers, architects, and developers to designing solar thermal systems for a variety of large-scale commercial applications. We evaluate each project, and design custom systems that are optimized for the unique needs of your business. Free Hot Water’s extra-mile customer service can also include submitting all documents necessary for permits and help to get you all applicable financial solar incentives.